The young man in this photograph is well prepared for a cold Canadian winter. He is wearing a fur coat and fur hat. The photographer who took this portrait is William F. Tate who operated a studio in Seaforth, Ontario, Canada. This vintage photograph measures about 6″ x 4 1/4″ and is in very good condition. Six young women gathered at the studio belonging to William McComb (1844-?) in order to have their photograph taken. The studio was located in Muskegon, Michigan. What is the connection between these women? The woman seated in the center front row of the photo has an open book on her lap. Perhaps the young ladies are students. More is known about the photographer than about the young women. William McComb grew up on Prince Edward Island, Canada. He was of Irish descent. By the time he was fifteen years old, McComb had developed an interest in photography. In 1859, he volunteered to become the assistant of a visiting photographer in the area. He learned the business and photography skills necessary to pursue the career of being a photographer. His career path took him to jobs in galleries in Ottawa and Montreal. He then moved to the United States where he met Muskegon photographer, J. D. Westervelt. The two men decided to work together, and the partnership lasted for just one year. In 1879, McComb opened his own photo studio. He soon became the most popular photographer in Muskegon. In 1895, a devastating fire destroyed his studio and it’s equipment as well as his collection of 40,000 negatives. McComb opened a new studio and rebuilt his business. Besides photography, he had a strong interest in weather forecasting and in 1893, he joined the US weather bureau. His duties included raising flags to notify mariners of approaching weather conditions. A photo of William McComb can be seen below. This cabinet card has gold beveled edges and is in very good condition (see scans). This vintage photograph features three women wearing pretty kimonos and flowers in their hair. Judging by their smiles, they seem to be having a good time as they pose for their portrait at the Butler Studio in Chatham, Ontario, Canada. There was a time when wearing this Japanese style clothing was quite popular in parts of the United States and Canada. This is apparent because it is not uncommon to find cabinet card era photographs with Western subjects wearing kimonos. In fact, you can view other photographs of Western women dressed in kimonos in the Cabinet Card Gallery’s collection. Place the word “kimono” in this blog’s search box to see other photos exemplifying this impact of Japanese fashion on American/Canadian fashion around the early twentieth century. The photographer of this image is J. S. Butler who operated as a photographer in Chatham from 1874 until 1902. A number of his photographs can be found in the collection of the Chatham-Kent Municipal Museum. A photo of Mr. Butler can be seen below. The pretty actress featured in this vintage real photo postcard is film actress Marie Prevost (1896-1937). She was born in Canada and during her twenty-year career, she made 121 silent and talking movies. She was originally “discovered” by Mack Sennett who inked her to a film contract after she played a bit part in one of his movies. She was only on the set (Keystone Studios) because she was running an errand for the law firm where she was employed as a secretary. She became one of his Bathing Beauties in the late 1910’s. She appeared in dozens of Sennett’s short comedy films. Her first lead role was for Sennett in “Yankee Doodle in Berlin” (1919). She than began to make feature length films for Universal Studios, where she signed for $1,000.00 a week. In 1922 she moved to Warner Brothers where she became one of the studio’s leading ladies (her contract was for $1,500.00 per week). Her movie roles at Warner included “The Beautiful and Damned” (1922), “The Marriage Circle” (1924), and “Kiss Me Again” (1925). Warner Brothers dropped her in 1926 and her career began to diminish as she was offered primarily secondary roles. Her personal life also began to decline, if not plummet. Her mother died in 1926 and her second marriage, to actor Kenneth Harlan, fell apart in 1927. She became very depressed and her symptoms included alcohol abuse and binge eating. In 1928 she was cast in “The Racket” which was directed by Howard Hughes. The pair had a brief affair and when it ended, Prevost fell into an even deeper depression. It became increasingly difficult for her to obtain parts in films and her last film role was in 1936. At the age of 38, Marie Prevost died from acute alcoholism and malnutrition. Her estate was worth just three hundred dollars and her death helped prompt the creation of the Motion Picture & Television Country House and Hospital. The details of Prevost’s death have become a bit of Hollywood legend. She was found in her apartment two days after her death. Also at death scene were empty bottles of alcohol, a promissory note to Joan Crawford, and Prevost’s pet dachshund. She was discovered because neighbors had complained about her dog’s continued barking. The legend claims that by the time she was found, her corpse was half-eaten by Maxie, her dog. It was asserted that this of course was only because the dog was trying to awaken his deceased master. This story is not true, but it appeared in Kenneth Anger’s book “Hollywood Babylon” (1959) and in Nick Lowe’s song “Marie Provost” (1978). The lyrics from Lowe’s song include “She was the winner, That became the doggie’s dinner, She never meant that much to me, Woe, poor Marie”. This postcard was published by A.N. of Paris for Universal Films. It is part of as series entitled “Les Vedettes de Cinema” (The Stars of Cinema). This postcard is the first in the series (No. 1). This cabinet card features five adorable girls who are very likely sisters. The children are all nicely dressed and hatted. The kids are sitting around a basket of flowers. The girls were photographed by “The Elite” Photographic Art Studio in Halifax, Nova Scotia, Canada. The proprietors of the studio were Kelly & Company. Research reveals that the Kelly studio was sold to George A. Gauvin but the year of that transaction was not identified. All of us experience coincidences; events that seem to be very unlikely occurrences. The carte de visite portrait above played a role in one of my latest unlikely experiences. I left my home in New York to attend a wedding in Montana. Before I left, I entered a Canadian cabinet card into the Cabinet Card Gallery. While in Montana, I visited several antique stores searching for vintage photographs. I only found one image to purchase, and you can see it above. The day after I returned to New York) I entered my newest image to the blog, I was surprised to notice that the photographer of this carte de visite image is the same photographer of the cabinet card that I entered right before leaving for my trip. Amazingly, the images were both photographs taken by Edwin Poole. 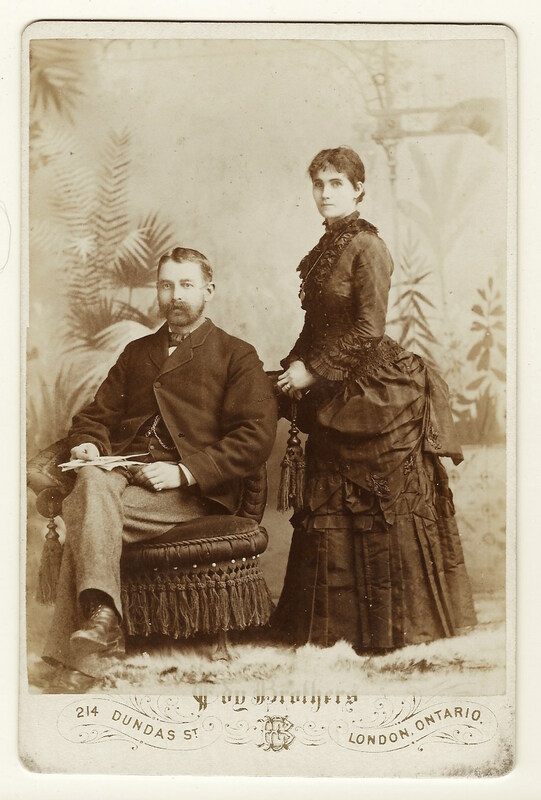 The cabinet card image was taken in St. Catharines, Ontario while this CDV image was taken in Chatham, Ontario. To learn more about Mr. Poole, view the description of the image entered in the gallery directly before this one. I am truly amazed by this coincidence although I take little meaning from it besides “strange things happen”.